DJI Mavic Pro is a super compact, lightweight, foldable drone designed for professionals. Despite its small size, Mavic pro features the modern navigation systems for enhanced control, a high-resolution camera, and a front collision detection sensor. You can operate it using its easy to use a remote control or using the DJI Go app downloaded onto your smart mobile phone. Our DJI Mavic Pro review provides a detailed assessment of the features found on this drone, its advantages, user opinions, and its downsides. These ideas will help you make up your mind when shopping. Some of the notable features that define DJI Mavic pro include the 12 MP camera that captures sharp images and videos. The camera is attached into a three-axis gimbal that gives you the freedom to adjust the drone's camera. Other excellent features that define this drone include a 40mph speed, a 27-minute flight time, and automated landing and take-off control. The Mavic pro drone is an essential gadget for photography hobbyists and enthusiasts who love to explore the sky. Depending on your preference, you can use the Mavic Pro outdoors or indoors. DJI Mavic pro is designed from light composite materials to reduce weight alongside improving maneuverability. Besides its lightweight, Mavic Pro is also one of the few mini drones equipped with obstacle avoidance sensors. Under normal light intensity, the front sensors can detect and avoid objects that are 49 feet away. The drone will stop if the object is a few feet away from the object. Nevertheless, the sensors may not work as intended in low light settings. Apart from its lightweight and sensors, this drone utilizes the GPS and GLONASS navigation system. The two navigation systems are responsible for the auto landing/take off, and hovering functions. DJI Mavic pro is controlled by a small controller provided in the drone's kit. Regarding its design, the black colored controller features rubberized clamps that hold your smartphone when streaming live footage and two antennas for seamless communication between the drone and the transmitter. Moreover, the transmitter features a USB port that facilitates mobile app control and some basic control keys for easy flight control. Some of the basic controls found on this transmitter include the left control stick, the right control stick, the return to the home button, and the power on/off button. As suggested by its name, the return to home button positioned above the left controller stick, helps you return the drone back to its take-off position. This key is crucial when you are unable to land the drone manually. Another essential key on this remote controller is the left control stick. This stick lets you take off, land, or rotate the drone clockwise or anti-clockwise. On the contrary, the right control stick lets you fly the drone to the right and left or forward and back. Besides the keys, Mavic pro’s controller also features a LED screen that displays the drone’s status. In case you are interested in other drones from DJI, you should read our review of the DJI S900 drone. From our DJI Mavic Pro drone review above, we can argue that the drone has its limitations and downsides that you ought to consider before purchasing it. We have compiled the advantages and downsides to enlighten you. 1. Portability. This drone is designed from a lightweight composite material, and it can be folded to almost half its size. In fact, the drone weighs 743 grams, and it is the size of a water bottle when folded. 2. Reasonable camera resolution. Besides the compact design, DJI Mavic also has a 12 MP camera that lets you capture sharp videos and photos. You can adjust the camera to an appropriate photo/video shooting angle. This feature is useful for photography enthusiasts. 3. Powerful battery. DJI Mavic pro comes with an intelligent and powerful battery that charges fully in 60 – 90 minutes. The battery can last for 27 minutes. 4. Intuitive and responsive controls. In the bottom line, we like DJ Mavic Pro because of its controller that has few and easy to master controls. Besides its ease of use, the responsive controls also let you command your drone appropriately. 1. It is not resistant to weather elements. The manufacturer maintains that you should not fly the drone during rainy or snowy days. This is because the elements can spoil the drone's electrical system and cause a crash. 2. It is not stable during windy days. Besides not being weather resistant, this drone’s lightweight is also not intended for windy settings. Strong winds can interfere with the drone’s stability or at worse; the wind can blow the drone away. This drone has an excellent rating on many DJI Mavic Pro review sites. This shows that the drone meets the expectations of many users. For instance, one user says that he loves it because it is easy to assemble, has a good speed, and it has a long flight time. 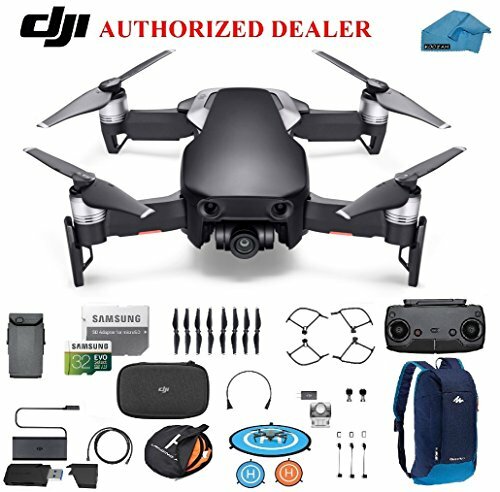 Another positive reviewer says that she loves DJI Mavic Pro drone because it is portable as it comes with a small backpack. However, the client says that the backpack is quite small. Based on our DJI Mavic Pro review above, we can say that Mavic Pro is a feature-rich portable drone designed for professional hobbyists like photographers, and sky explorers. The drone features decent navigation systems, a 12 MP camera with a good resolution, and an easy to use remote control. However, the drone is not weather resistant, and you cannot use it during a windy day. If you have tried this drone, please share your DJI Mavic Pro review to enlighten other readers.